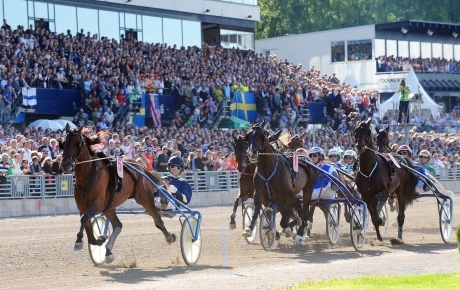 Best Bet of the day is in the first race and heat of the Swedish Cup. No.5 VÄSTERBO HIGHFLYER is a last start conditions race winner over the C&D but significantly ran terrific time from the front and had NUNCIO, Elitloppet winner last year, back in third position. Could’ve gone for the Elitloppet after that terrific win but smart move from connections to go for this. The Dynamic duo of Swedish Trotting Örjan Kihlström and Daniel Reden combine and is my overall tip to win the final. Lay of the Day comes in Race 2 No.1 JATO. American runner and hard to assess the form with rivals but only has moderate conditions form from The Meadowlands and Yonkers in last couple of starts. Not attracted at all to the 2.25 odds earlier in the week. QUICK FIX is the one to beat in the third heat, finished third in both the same heat and final 12 months ago but comes into this year’s series off better form. VOLSTEAD is best horse in race, was flying 12 months ago with G2 win and competed in Elitloppet heat but galloped in Gavle G2 last week and in Heat of Italy’s big G1 Gran Premio Lotteria. BUZZ MEARAS, who races in the BOLD EAGLE colours, is a last G1 Copenhagen Cup third and will without doubt go close. WILD HONEY wouldn’t be out of place in the Elitloppet but instead runs in the mares feature for the weekend, Race 5, with trainer Daniel Reden having some other top chances in the big race and after a terrific G2 second in an Eltiloppet trial at Gavle last week should be winning Race 5. Race 12 is the G2 Harper Hanovers over 3140m and ROD STEWART has been catching my eye of late. Five runs back was hugely unlucky in a Vincennes G3 when being checked at the start before absolutely storming home late. Last start was third in Gavle G2, behind WORKOUT WONDER and WILD HONEY, in a race where the back markers dominated. Concerns are the distance, only second two back in Finland and the 40m handicap but with any luck is a big chance. SAUVEUR was second in a G2 over the distance at Orebro three weeks back and raced well during the winter at Vincennes. EL MAGO PELLINI finished third in this 12 months ago and drops down from G1 level in Denmark’s Copenhagen Cup at Charlottenlund and U.S.MALE E.P. is the improving one off the front row and is certain to stay. DONATOMITE looks a class act in Race 13 the final event on the program. Race 3 is actually four different races over 640m, used to be 140m! No. 1, 2, 3 take each other on in Heat 1, No.4, 5, 6 in Heat 2 and No.7, 8, 9 in Heat 3. The Heats are run within 10 minutes and then about a 10 minute gap to the final featuring the three winners of the heats. Bets must be taken before the first heat. 1 Spring Erom (50/1): 12yo veteran who is racing as good as ever. Winner of a trial race two weeks ago that booked his ticket for this. Sixth in G1 Olympic Trot before that. Whilst he is pretty long in the tooth he seems to be as good as ever. Rough chance of making Final. 2 D.D.’s Hitman (14/1): Winner of three from four this season. Third in Olympic Trot Heat behind Nadal Broline and Volstead two back. Last start he took his form up another notch with a brilliant win in the G1 Finlandia-Ajo (Finland’s Premier Trotting Race), over proven star Propulsion, in brilliant time unextended. If he brings that form here he will qualify for the final. 3 Delicious U.S. (9/4): Superstar mare now at the age of 8 but has been plagued by injuries. Unbeaten since August 2015 and currently on a winning streak of 13, in last 10 of those has been no longer than 1/4. 3rd in Final three years ago and can give the French champ a run for his cash. 4 Tjacko Zaz (30/1): To be driven by veteran American champ John Campbell. Clear X Factor of the Series. Winner of six of last seven but last time was the real wow moment. First-up since Boxing Day he flew out of the gate to lead, cop pressure all the way and run away and score easily in absolutely scintillating time of a 1:09.5 kilometre rate. Would’ve been competitive in the G1 Olympic Trot the same day on that run. Form from that Silver Division race has been rock solid and whilst after that run he was at least a Swedish Cup contender, connections have decided to take him to the cream. Very interesting contender. 5 Bold Eagle (7/4): No words can describe this freak who is the winner of 34 from 39 starts. Two times Prix d’Amerique winner and this year completed the Triple Crown of French Trotting during the Vincennes Winter and similar to the American feat from a couple of years ago in the thoroughbreds, it hadn’t been completed since the 1970s and also was only the fifth horse in history to do that. This series is his biggest test yet. Racing twice in one day, fast time around in French terms is a tiny track (1000m the standard circumference for Swedish track but in France that is the minimum) however the 2015 G1 European 4YO Derby over a 1000m track in The Netherlands. This was a problem for Rapide Lebel in the 2012 series and came from the same stable of Sebastien Guarato. Will have to earn it but in my opinion is the best horse on the planet in either code and is one of the best horses we’ll ever see. Continues to do the impossible, hard to knock. 6 Cruzado Dela Noche (25/1): G1 Copenhagen Cup winner in Denmark a fortnight back, controversial winner. Will be up against it. 7 Takethem (80/1): Winner at this meeting last year of a Silver Division Final and has gone on to better things since. Down the track in G1 Copenhagen Cup last time and was second to Delicious U.S. before that but up against it and after the barrier draw no chance here. 8 Resolve (12/1): American who was runner-up in this heat and the final last year, storming home in closing stages. G1 Yonkers International Trot winner from last year also. Horror barrier draw and will get back and be doing best work late but remains to be seen whether that will be enough to qualify this year. 1 Up and Quick (11/4): Prix d’Amerique victor of 2015 that badly lost form the campaign after. G2 Argentan Sprint winner leading all the way last time in a race where he was too good and brilliant and a great training performance from Franck Leblanc to get him back to form. Had for a long time thought he wasn’t much chop in sprint races (2014 and 2015 Grand Prix de Frances) but he silenced my theory last time. Gets the perfect barrier here and can lead all the way as he did last time and can give driver Franck Nivard and France both heats, which was the case last year. 2 Twister Bi (12/1): G3 winner at Vincennes five back and was third in the G1 Finlandia-Ajo, Propulsion second, two back and last week in Gavle G2 was down the track. Outclassed by a couple. 3 Propulsion (11/4): Winner of 20 from 42 and a top class G1 horse. G1 Hugo Abergs Memorial victor from last year and was the winner of Finland’s big trot 12 months ago and finished 5th in the Final of this last year. Somehow went winless throughout the Winter in France but ran respectfully in the Prix d’Amerique finishing fourth. Shouldn’t have trouble qualifying. 4 Nuncio (14/5): Sweden’s flagship horse. Three-wide all the way in the final two years ago, as a 4YO, and was beaten less than a neck in third. Last year finished second in this heat before a tough win in the final. Winner of first two starts this season but since things have gone downwards badly. Only fell in for 2nd in a G2 at this track before galloping at the start of the G1 Olympic Trot Final, odds-on favourite on both occasions. Last time was only third in a Conditions event here when he had a lot to do behind the very impressive Vasterbo Highflyer in fast time but still didn’t look the Nuncio of old. Remarkable to me that he is favourite here. Lots of others in better form than him and whilst we hope he is at his best for the Bold Eagle clash, I can’t see why he is going to qualify on his last three runs. Stefan Melander is a gun trainer but this will be his best training performance if he can get up to win the Final again in his long distinguished career. 5 In Vain Sund (35/1): Fan of this horse. Winner of a strong 5YO G2 at Vincennes in January. Had the G1 Copenhagen Cup at his mercy last time before galloping right before the line. Biggest test but has plenty of ability. 6 Timoko (13/1): What more can be said about this 10YO warrior. The winner of 33 of his 96 starts including 26 placings including two heat wins in this series and the 2014 Final. If the last two renewals of this, and the Gran Premio Della Lotteria from earlier in the month is anything to go by, his best run will be in the heat and not the Final, although under the circumstances of the Gran Premio Lotteria Final he had to brake the clock double to score.. As he gets longer in the tooth it seems he can’t back up twice in one day. Is looking to qualify for his 5th straight Final after being third in 2013, first in 2014, eighth and last in 2015 and fourth in 2016. Absolute marvel. 7 Dante Boko (22/1): G2 Swedish Cup Final winner 12 months ago. Adrian/Lutfi Kolgjini representative in the series but barrier draw makes things tough. 8 Elian Web (70/1): Finnish raider that isn’t up to it and no hope from the draw.